Dozens of workers have been taken off a North Sea platform amid fears of huge waves due to the approaching Storm Caroline. CNR International said it was taking the precaution on Ninian Southern, 75 miles (120km) east of Shetland. The firm has been carrying out checks on the platform's "jacket", the steel support frame of the structure. A total of 159 people were working the Ninian South platform. CNR said 90 personnel remained on board. It said there were safety concerns over wave height during Storm Caroline which is due to hit on Thursday. The company said no other installations were currently affected. 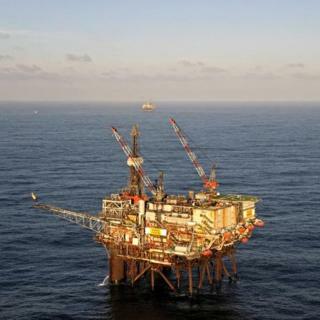 A spokeswoman said: "CNR International (UK) Limited advises that, due to an adverse weather forecast during the coming days, it has commenced a precautionary down-man of non-essential personnel from its Ninian Southern platform. "This is in accordance with existing procedures developed to safely manage the structural integrity of the Ninian Southern jacket. "CNR International has been carrying out remedial work on the platform's jacket structure and assurance activities are ongoing to confirm their effectiveness. "There are storm conditions forecast for the coming weekend, therefore, in order to ensure the safety of all personnel on board, the company has taken the decision to partially down-man Ninian Southern as a precaution. "The safety of the personnel on board the platform is of paramount importance for the company."